Great news! The Friends & Family Event is currently going on at Serena & Lily. Use my code (bottom of post) and receive 25% off your order (through October 16th, 2017). The Westport store where I work a couple of days a week is full of inspiration. Every time I go to work, there’s something new. Just when I think it can’t possibly get any better, it does! It’s that beautiful. 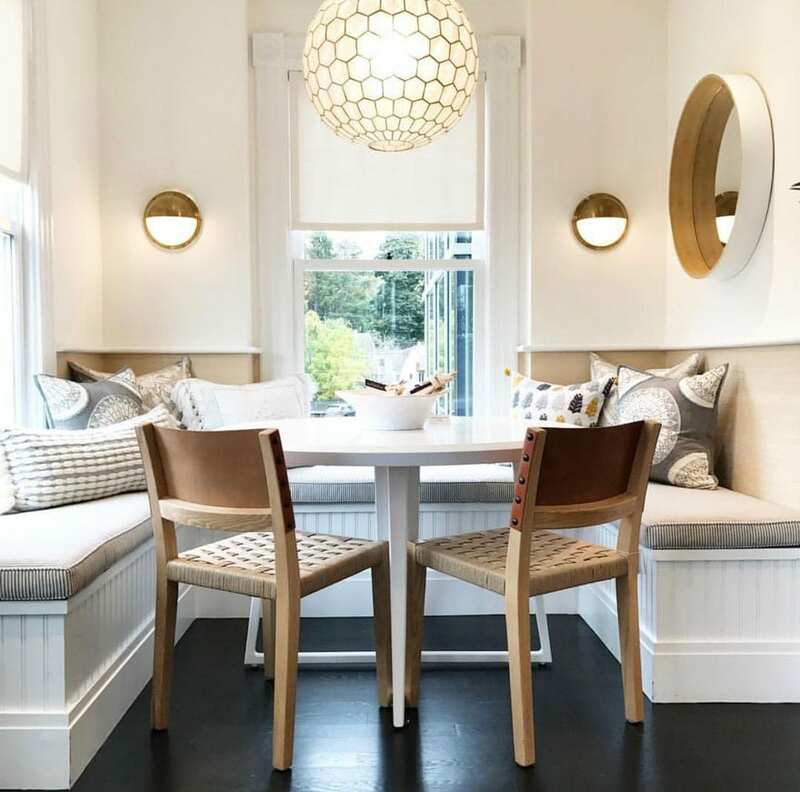 I love the kitchen nook with built-in bench seating, sconces, pillows and a pretty mirror. This week I stopped by Brooke’s house and left with my heart full and feeling very inspired to make some changes at my house. I’ve seen Brooke’s house on her blog and Instagram. (Click here for links). Brooke makes changes quite often. Art that was once in the kitchen and now in her family room makes me realize how we can really change the look and feel of a room by adding some new things, or just by moving some stuff around. 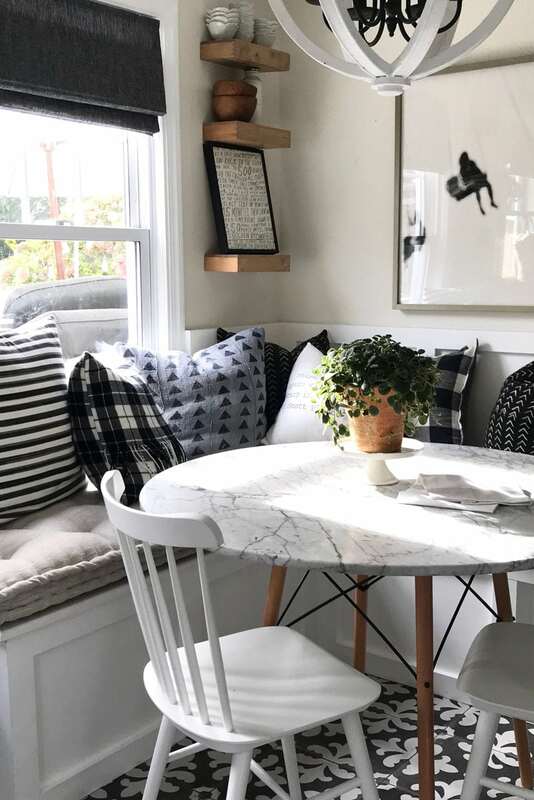 She trades out pillows, chairs, stools, plants and art to make changes that feel all warm and cozy. Isn’t that the feeling we want to have in our homes? Below are some things I added to my kitchen nook after returning from Brooke’s house. 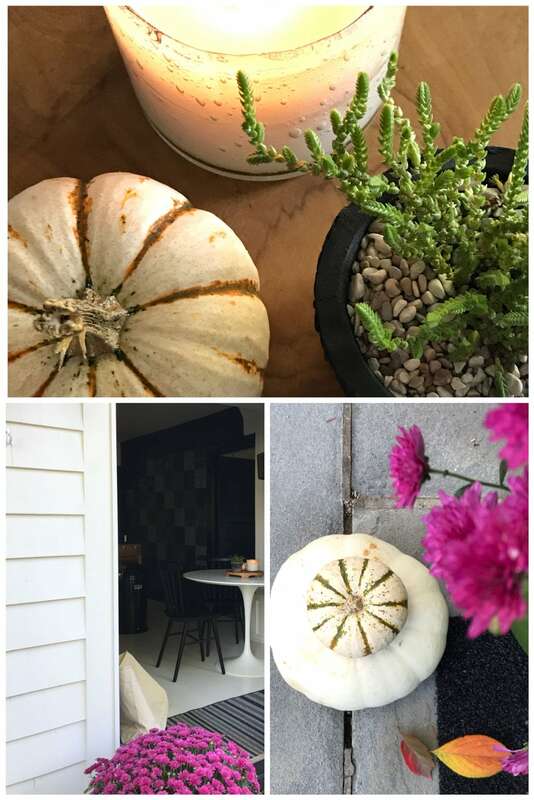 A striped pumpkin on a footed-teak board from Terrain, this fall candle, a succulent and pink mums on the back porch that were inspired by this dish soap. Our kitchen gets shared on Instagram, blogs and Pinterest a lot. I see it pop up all the time. My mom even called me last week to say she sees our kitchen on Pinterest…I didn’t even know she knew about Pinterest! 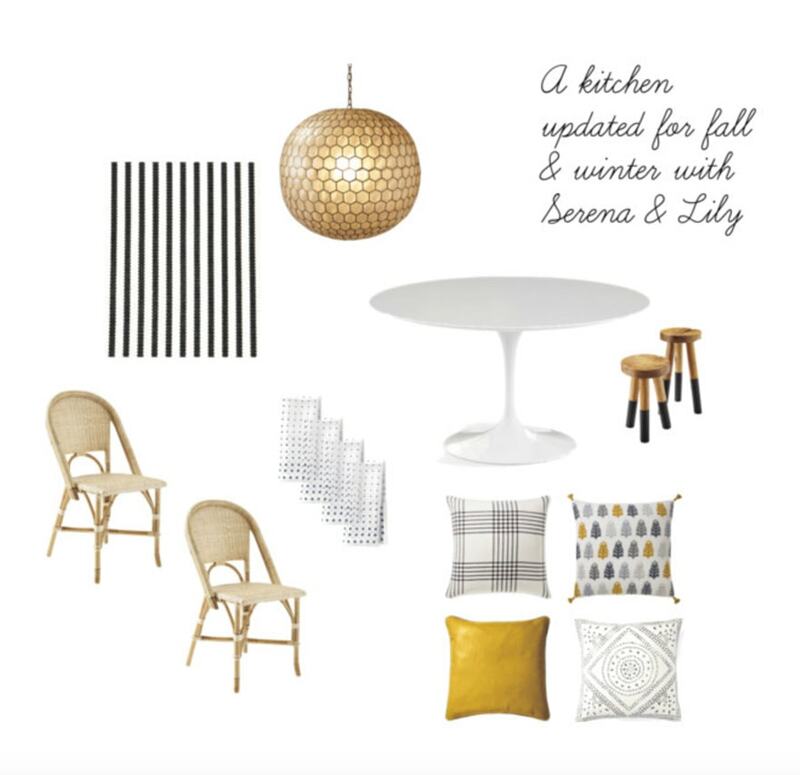 Below is our kitchen today and then some ideas I’m thinking about to update our kitchen for Winter. I love the Tucker chairs from Serena & Lily so much that I’m thinking of adding four more and using them in our dining room. They are the best chair and come in several colors. And then maybe I’ll move the Enzo Mari Apple & Pear Poster to the dining room…Brooke has them in her kitchen in fog and white which looks great with her marble table top. We recently sold 32 to be used at the newly renovated Gray Barns in New Canaan, CT. I can’t wait to see them in their restaurant in the Silvermine area of Norwalk and New Canaan. For 25% off your Serena & Lily order, use my code FAMILY-53 Offer ends at 11:59 pm (PT) on 10/16/17. Call the Westport store and I would be happy to help you! (For full disclaimer, please go to the the Serena & Lily website and click on details of the sale. Call 203-635-8000 and ask for Annie. Ever wonder what the oldest restaurant is in your state? Here’s a list state by state. Green Goddess Immune Boosting Soup, it’s beautiful and might help you get through the cold and flu season without a sniffle. As mentioned above, if you’re in the area of Gray Barns, it’s worth a stop or even as a destination for the weekend or a night on your way from NYC to Boston. Pumpkin Pie Spice from terrain is everything you need in a fall spice. Note: This post contains affiliate links which allows us to make a small commission from your purchase. Your purchase price will always stay the same. Thank you for helping support this little blog! I love this post! What a deal!